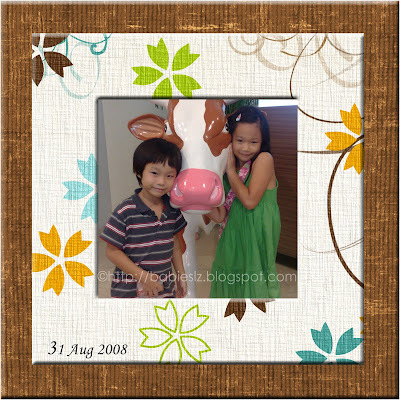 We were at Raffles City.... Z saw the cow and insisted that I took a pic of them with it. Look at how vain they are! 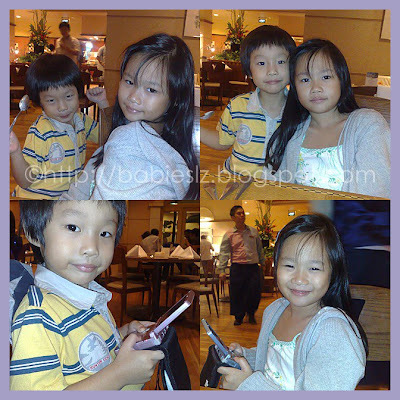 How can I leave home without my hp when they love taking pictures and I am 'addicted' to taking their pics! FYI, I took most of the pics with my hp. L has Chinese Enrichment lessons with the school every Saturday for 2 months, I forgot and booked Beanie's checkup today. Remember I told L she will get to see Beanie the next checkup? I didn't want to disappoint her but at the same time, we didn't want her to miss any lesson. Finally we decided to rush to the clinic for the checkup and L can go for her lesson. Like very BIG deal hor? It is, for us! I hoped that we didn't have to wait long for our turn and my wish was granted. We waited for about 15 mins only. I was worried when I stepped onto the weighing scale coz last checkup, I put on 1+ kg and Doc already warned me about my weight gain. Phew! I put on only 700g for this month! Yeah! This is the very FIRST time throughout my 3 pregnancies that I put on less than 1kg! Beanie @ 14+ weeks, 78.3mm. The highlight of the checkup was of coz LZ get to see Beanie! I was lying on the bed with Doc next to me and my 3 lovely ones were struggling to see where's Beanie. LZdaddy carried Z while L struggled looking at the screen. My poor girl.... They listened to Doc as she was pointing to the different body parts of Beanie. I think Beanie sleeps a lot and not as active as jiejie, more like Z. We saw Baby's little stomach, spine, little waving hands, little kicking legs and eye sockets etc.... So exciting! Then I asked the question that has been on my 3 loved ones' mind. Is Beanie a BOY or a GIRL? Doc scan around and told me chances of Beanie is a GIRL is quite HIGH! Wow! Of coz, it is not confirm yet. LZ were very well behaved throughout and I praised them for being such good kids. So far, everything is fine for us but I have stop taking my vitamin, Glucosamine. That means I will have to bear with my knee ache. Doc told me my joint will hurt more as time goes and I can foresee it that when I put on my weight. I just hope I don't have any backache but then again, I can foresee that will happen also, just like my past 2 pregnancies. My backache was so bad then that I have to see an orthopedic surgeon and he can't do anything about it. Whatever it is, I know I will enjoy this pregnancy with my 2 babies cheering me on and of coz my dear hubby. Z had his followup checkup (for his elbow injury) today and I was very happy to hear what the doc said! According to the x-ray, Z has fully recovered! Yeah! LZdaddy accompany L to the food court to have her meal so it was only Z and me at the x-ray area. He was such a goody boy to go in to the x-ray room on his own, knowing that I can't go in with him. Doc go through the x- ray result and told me that he can't see the crack anymore which is a good news. Then he asked Z to do some hand movements to make sure that he has recovered. The best part for Z must be when I asked Doc if he can go back for swimming lesson and he said yes. Z was so happy when he heard that and so was I! We were given an open date for 2 years before we go and let hope he doesn't have to go anymore. No matter how moody I am on Thursday, I have to keep my promise to my kids to bake cookies with LZ for their teachers. I think it was good that I did baking with them and it kept me busy the whole afternoon. It was LZ's idea to bake for their teachers and I thought it was a good idea too. I think homemade gifts is more meaningful. I managed to find an easier recipe for the kids to handle. 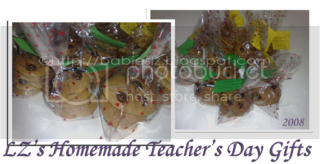 These were the cookies that we made on Thursday for their teachers. They were in charge of the measuring and mixing. Of coz I was the one in charge of the oven. I decided to print the cards out as Z was frustrated trying to write on the small piece of papers. The whole day he kept nagging me to hurry print out the cards but I didn't get to do it till late at night. Those with yellow cards were for L's teachers and those with green cards were for Z's teachers. L had 7 bags to give out and Z had 6 to give out. I made one extra each for them just in case we missed out any teachers. I was glad I did that coz both decided to give to another teachers each. On top of baking for the teachers, Z insisted that I bake M&Ms cookies for his friends. They had a small celebration in class, so Teni (Joash's mommy) and I decided to make something for the kids. I was planning to buy snacks but my dear boy said no. When I was about to start baking, I realised I ran out of brown sugar! Arrgh! I had to wait for LZdaddy to buy it! And he didn't come home till midnight! I 'forced' him to cut the homemade cards for me and packed the cookies. Hehehe.. I was glad I took a nap while waiting for him... By the time I am done with the baking, it was already 4AM! I was so tired by then coz I have been sleeping very early since I found out I was pregnant. L told me her friends also have things to give to teachers so they went to the teacher's room and 'hunt' around for their teacher's tables and place the cookies on it. She managed give out all before school starts. She also told me the school had a mini concert for the teachers, organised by the PSG mommies. For my 'hard' work, LZdaddy decided to 'reward' me by going breakfast with me and we had a wonderful couple time. In the HK box: Steamed chicken wings, HK shaped steamed tofu, tomato, container with light soya, blanched broccoli, HK shaped dragonfruits & golden kiwi, HK shaped rice. 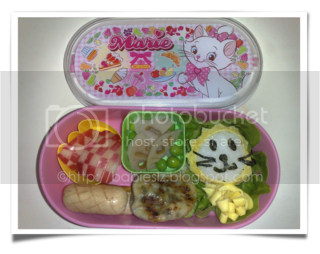 This was yesterday's bento and I didn't have time to post it coz I wasn't in the mood and was also busy with the Teacher's day gifts. I cooked stewed chicken wings yesterday and decided to keep few pcs of the (uncooked) wings for today's bento. I steamed the chicken wings together with the rice so one less thing for me to do. My girl loves tofu, I steamed tofu for her and she requested for light soya to go with it. I bought this box some time back and my girl has been complaining why she didn't get to use it. Thought of preparing similar bento for daddy but he has been in and out of office quite frequent that I don't have a chance to prepare for him. We planned to give her $5 initially for the trip, then I changed my mind, thinking she may want to buy veggies since she likes to eat it so we gave her $10, including money for her meal. We were not sure how much the food (though she told me the burger cost only $1/-) cost so better give her more. Then 2 of her classmates 'took' money from her! Both the classmates wanted to eat but their mommies did not give them any money (one of their mommies were on the trip but left earlier). They asked from L! I am mad coz they never mentioned about returning money to my girl! Why they need $2 each? I know the girls have their water bottles with them, there are water coolers in the school and most of the food like chicken rice cost only a dollar. I told my girl she should have share the snacks that I packed in her bag or tell them they must return the money. It was worst when she couldn't remember what happen to the other 90 cents (she used 10 cent to call me)! She spent $10 in a day! This will be the one and only time we are giving her so much for a trip! I hope she learned something from the trip and also to spend money wisely. Girl, I hope you know those are daddy's hard earned money, so please think before you buy anything. Please don't disappoint us again.... And please ask you friends to return the money. Today, her friends did not mention about returning the money... Haiz... My girl 'forgot' to ask them. I told her to call one of them since she has the number. She couldn't get her and I called her daddy's phone (she gave my gir's 2 numbers). The girl's dad did not know anything and he said he will clarify. We shall see if anyone of them return the money..... They will meeting again during the school holiday and I shall ask my girl to tell them to return by then. Do you borrow money from your classmates when you are at this age? Do you know I am pregnant now? You must have known it long before I do... Is that the reason why you choose to leave me 3 months ago? You know, I will still be able to cope even if I have another child. I will not neglect you... You are like my first child... I miss you dearly.... If only you are here to share the joy with us. I gave your cage to Joe Joe, hope you don't mind. I thought you may like him to have it since you have spent some of your growing up years with him. I still keep some of your things with me. Just so that I can touch them and it is like having you around me. I miss you... I miss you sleeping with me. I miss you in the kitchen with me. I miss you everywhere in the house. Sorry that I am unable to go to columbarium to visit you. LZdaddy wouldn't allow me to go now that I am pregnant. Please forgive me... No matter what, I am thinking of you and you will always be in my heart. I remembered reading the recent interview of the owners in the newspapers and was planning to bring the kids there. L told me she enjoyed very much but complained not enough time. Hope we can find time to go during this school holiday. She told me to pack her a bento for the trip but yesterday, she changed her mind when her teacher told them they can buy food from the cafe. Being kids, she was excited to buy things apart from the school canteen. She also said she wanted me to have a rest day. How sweet! I remembered some time ago, some commented that how nice that my kids don't fight. Well, they do. Recently they fight because of Beanie. Z: No! This is my Didi! I sing to him! L: No! This is my meimei! I can sing to baby too! Z: I am the gorgor! I take care of him and I sing to him! L: But I am the jiejie and your jiejie too! Why can't I sing to Baby? At this time, I interfered and told Z that was not right for him to do this to L. Both of them are Beanie's jiejie & gorgor and they should not fight. I went on the explained how to they should treat each other and blah blah blah... I was trying hard not to laugh coz it was so funny to see both of them fighting over this. I wonder if they will fight for Beanie's attention in future. In the end, L finally got her chance to sing for Beanie too. I'm not if I have blog about this... Z used to hope that Beanie is a girl but he changed his mind coz he had a dream and said that Beanie is a BOY. He was disappointed initially (when he had the dream) but he soon got over it and thinks it is great coz that means he has someone to share his toys with and talk about all the boy's stuffs (that's what he told me). I finally laugh out loud as soon as both left the room and LZdaddy don't understand why they fight over such a trivial thing. Whenever they talk about Beanie or 'play' with my tummy, it never fails to bring a smile to my face. 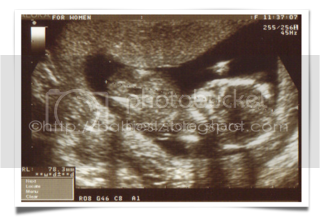 So whether Beanie is a Boy or a Girl, we'll have to wait for probably another month before we know. Top: Ham, couple rice, flower shaped cucumber. Bottom: Sliced strawberries, dim sum and edamame. I was supposed to make the ham into flower shapes but somehow it didn't turn out the way I want it. The rice on the right is a girl with a ribbon on top of her head and the bigger size one is the boy. Nowadays, the first thing my girl does is to check what I have prepared for her, or rather how I display her food. This morning, she goes "Wow!" again. She loves the couple! She kept saying "So cute! So cute!" Hmmm... 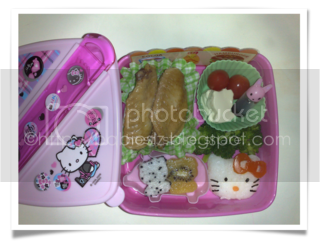 I better tell her I won't be prepare cute bento all the time and I will only do it when time permits. 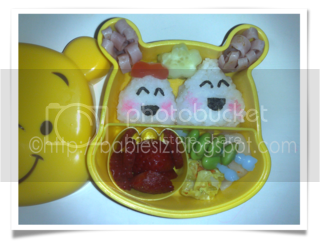 Today, she makes me happy by finishing everything in the bento again. From left, clockwise: Checkered shaped water apple, lotus root with peas, lion shaped rice, egg, chives & vegetable dumpling and sausages. When my girl saw the 'lion', she said "Wah! This lion not scary at all, very cute!" At least she knows that's a lion and she called it a baby lion (cub). I used the egg sheet for the lion's hair, using a cutter. Hmmm.... I realised I yet to use some of the things. What to do... Usually L is the one that decides what she wants. She told me her friend, Kevin said he envied her coz mommy always prepare nice pretty snacks for her. Well, I have nothing better to do in the morning. Hahaha... I think her friend didn't know that she is quite picky about food at times so I had to make effort to make it appetizing for her. Surprisingly, I have so much time this morning to decorate the bento. I woke up without any idea what am I going to prepare. I usually prepare things the night before but not this time. Z has been very excited with the School Open House this year. The teacher taught them how to write aninvite for us. Ever since he brought home the piece of paper, he has been reading it to us and requested me to put it up on the wall, for fear that we forgot about it. He was so excited to the extend that he asked me if he can choose what he wants to wear for the day and he has been asking me for the past few days! Hahaha... So in the morning, he excitedly chose what he wants to wear and asked if he looks good. Of coz he does! Before we go, LZdaddy and I knew that he wouldn't have many work on display coz he has been absent from school for a long period of time and my boy knew it too. It was very sweet of the teacher to try to let him complete as much as possible so that he doesn't feel left out. We actually stayed back a while longer on one of the school days so he can do a little more. When we arrived, Z happily showed us, of coz Jiejie too, his works. He explained to us what he drew and what he had written. 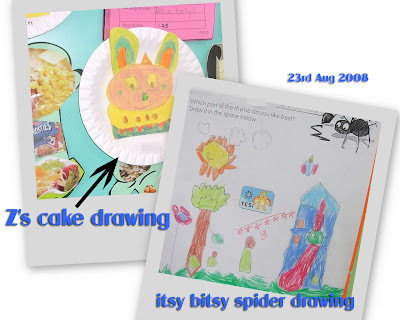 When we saw some of the worksheets he did, we were very impressed! I asked him did he do it with teacher's help or he did it on his own, he proudly told me he did all of it on his own without teacher's help. I think it was wrong of me to doubt him... We also went over to L's old classroom to say hello to her ex-teachers and have a look at what the k2s did. Just when we were about to leave, Z approached Ms B to remind her the egg decoration that she promised him on Friday. So we stayed a little longer so he can decorate his egg. Through this, I noticed my boy has become more vocal, he is more willing to speak up/ask. After the 'tour' of his work, my boy brought drinks for us. Since it was raining heavily, we decided to head home for a nap (more for me actually, hehehe) and head off for buffet at Indulge at Park @ Grand Plaza Hotel. Wow! The buffet spread was great and with my favourite cheese spread! We were back home in time to watch Liverpool against Middlesbrough. What a match! 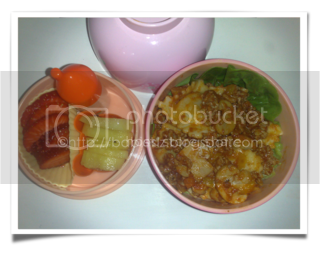 Left: Sliced strawberries & golden kiwi and a container with extra cheese powder. Right: Cheesy ravioli with beef, capsicum & button mushroom. I can't believe my girl asked for ravioli again for lunch and she had a HUGE portion of it! Makes my life easier when she asked for the same thing for lunch. I gave her extra cheese powder and she finished the whole bottle of it. The golden kiwi is very sweet and if you like it, go grab it from cold storage. Z and I had that too and I added chilli padi for my pasta. Simply love it when my pasta is spicy! Hehehe.. Whenever I ran out of idea what to cook, I just have to cook pasta and they will be happy. So I always have frozen minced beef in my freezer. I volunteered to help out for the P1 Maths Activity today (2 classes). Is is great to be back in school to help out and see my girl with her classmates. She was very sweet to tell me not to prepare bento for her this morning so I can sleep a little longer since I will be 'working' till I pick Z up. Thank you Sweetie. During break time, we mommies had time to catch up with each other. First thing one of the mommies commented was "Wah! You pregnant at the right time! I am sure you will benefit a lot from the government!" Errr.... I got pregnant not because of that leh... And I don't think I am getting a lot from the government unless I am a working mother. We, SAHM, are the FORGOTTEN ones.... So sad... WE are not getting as much coz we are not contributing to the society and we are just SAHM only! Anyway, I chose to be a SAHM coz I want to spend more time with my kids and I rather be the one bringing them up. LZdaddy, being the breadwinner, will have to SLOG on his OWN coz we decided that it will benefit our kids if I stay at home to take care of our children. Whatever it is, I have chosen this path and I have not regretted it since day one. I think enough of my ranting. Nothing will change no matter how much I said. Congrats To My Best Friend!